Comprehensive Pre-biotic and mineral resource for your horse! Make sure your horse is getting the proper nutrition it needs with EquiPride and EquiLix! SweetPro Feeds started production in 1991 and secured six patents between 1994 and 2004. We patented a new concept in non-molasses, free choice block supplementation which features Condensed Distiller Solubles. In 2002, SweetPro developed the ProBiotein process. We've taken a leading position in improving animal health and performance by doing it naturally. We do this by maximizing nutrient utilization to foster better immune response and performance. SweetPro makes supplements that help your horses, cattle and other animals stay healthier and grow stronger. Using our lick blocks, top dressings and other products, adds key ingredients to your livestock's normal feed, so their digestive systems can perform the way that nature intended. EquiPride is their premiere Equine Supplement. While most of the horse world recognizes the need for "probiotics" (the friendly microflora bacteria that aids horses in proper digestion), few horse owners are aware that "prebiotics" are needed to FEED this microflora to keep it active and healthy within the gut. Prebiotics are oligosaccharides, which are short chain sugars. Oligosaccharides can NOT be directly digested by the horse, they can ONLY be digested by Probiotics! The oligosaccharides that are used in EquiPride™ are fructo, mannan, and xylo. These 3 oligosaccharides were specifically selected by EquiPride™, because while they are good separately, once combined they are even better! How Are The Pre-Biotics At EquiPride™ Better Than The Competition? Many products only contain 1 type of prebiotic, but since selective digestion occurs, EquiPride™ targets 3 main types of prebiotics. This becomes a KEY ADVANTAGE for users of EquiPride because when probiotics are healthy and strong, feed gets digested better, nutrients are absorbed better and the pH stays balanced within your horse. EquiLix™ is a non-molasses, distillers grain based "all-in-one" vitamin and mineral supplement for horses that include strong prebiotic and enzymatic digestive aids for better horse health and superior performance. It is a non-molasses horse lick supplement which combines a complete vitamin, mineral and digestive aid package with buffers to help settle gastric distress. EquiLix™ comes as a 50 lb or 125 lb free choice lick block. This product works effectively to help improve hooves, hair coat, joint lubricity, feed utilization, circulation and reduction of colic. SweetPro Feeds has designed this supplement to maximize nutrient uptake from your horses' feed, and minimize the need for multiple supplements. EquiPride™ is a non-molasses, distillers grain based "all-in-one" vitamin and mineral top dressing supplement for horses that includes strong prebiotic and enzymatic digestive aids for better horse health and superior performance. It will complement forages, improve appearance, increase performance and enhance immune function through better feed utilization. EquiPride™ comes in 5 gallon pails and 50 lb bags as a loose top dress that can be added to your horses' regular feed. It works effectively to help improve hooves, hair coat, joint lubricity, feed utilization, circulation and reduction of colic. SweetPro Feeds has designed this supplement to maximize nutrient uptake from your horses' feed, and minimize the need for multiple supplements. Got A Performance Horse? Have a Horse That Travels? EquiPride Gold™ Is Your Answer! EquiPride Gold™ is a prebiotic and probiotic paste that is designed to support your horse’s appetite during the stress of work and competition. EquiPride Gold™ can be used before and after the "run" or the competition. It is an extra "energy boost" when energy demands are their highest. EquiPride Gold™ is also great to use before traveling or shipping as it helps keep stress down and encourages the horse to eat their normal rations. The Prebiotics and Probiotics help keep the gut operating as it should, even during the stress of competition, and the antibodies help to discourage harmful bacteria. Designed for the performance and show horse-- or any horse that is under stress during travel or training. Why Should I Choose EquiPride™ Over Competitors? It WORKS! All EquiPride™ products are better because of balance! There is no single silver bullet in our supplements. We focus on balance and strategic blends. EquiPride and EquiLix are "all-in-one" vitamin and mineral supplements for horses that include strong prebiotic and enzymatic digestive aids for better horse health, 25% better feed efficiency and superior performance. SweetPro Feed Supplements has designed these supplements to maximize nutrient uptake from your horses' feed, and minimize the need for multiple supplements thereby saving you time and money without sacrificing quality. Do They Have a Human Form of EquiPride™? What Do Customers Say About EquiPride™ Products? I found everything I was looking for in EquiPride and I'm very pleased with the results. In 3 weeks on EquiPride, the rain rot disappeared from all the horses! My husband, the farrier, was amazed at the change before his eyes and says he will recommend EquiPride to anyone who has a horse with hoof problems. EquiPride is the best vitamin, mineral and all around product for a horse. I have been amazed at the quality and the results that are consistently showing when my horses are on EquiPride™! I recommend it to all my friends and have just ordered the "human version" in the Health Bar form and can't wait to get it! A healthy digestive system is paramount to the health and well being of your horse-- and even yourself. These products are outstanding and I am glad to use and recommend them. 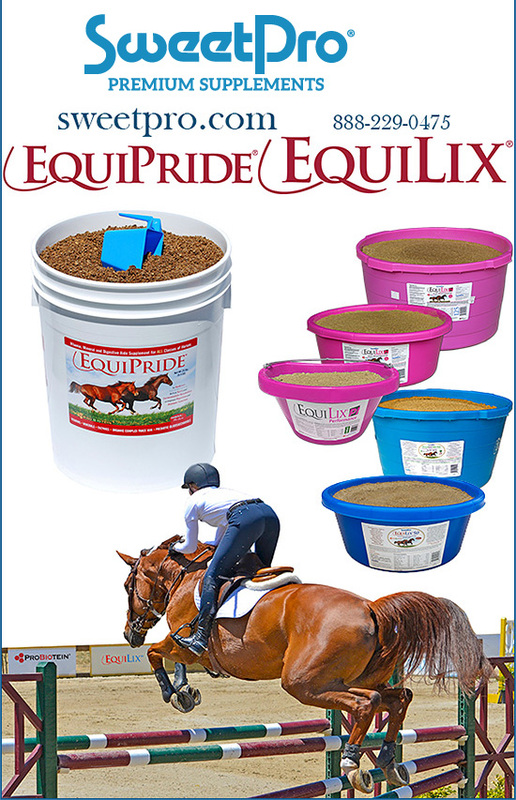 Order EquiPride™ or EquiLix™ Products by SweetPro For Your Horse Today! Healthy horses are made through healthy diets. Healthy diets are managed by concerned horse owners who want the very best for their horses. Your horse deserves a healthy gut for his digestion and vitamins and minerals to keep him strong and performance levels at optimal levels. Find out how EquiLix™ and EquiPride™ can help provide your horse with the best possible help for his digestion and health. For more information about EquiLix™ and EquiPride™ and to place your order, please call us today or ask for EquiPride from your local dealer.